Insects have reined the world earlier than mankind. They are omnipresent right from below the earth to hill top. Insects are very much associated with man’s life. Some are useful and some are highly harmful to mankind, one of which is Desert locust, the most harmful insect in the world. They are scourge of mankind since time immemorial. Locusts are the short-horned grasshoppers with highly migratory habit, marked polymorphism and voracious feeding behavior. They are capable of forming swarms (adult’s congregation) and hopper bands (nymphal congregation). They cause great devastation to natural and cultivated vegetation. They are indeed the sleeping giants that can flare up any time to inflict heavy damage to the crops leading to national emergency of food and fodder. Only four species viz. 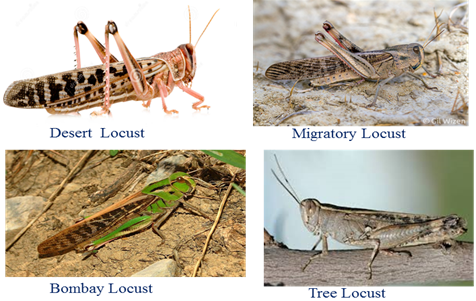 Desert locust (Schistocerca gregaria), Migratory locust (Locusta migratoria), Bombay Locust ( Nomadacris succincta) and Tree locust (Anacridium sp.) are found in India. The desert locust is most important pest species in India as well as in intercontinental context.